Yowza! Where to begin. After finishing up the GA beer excursion, it was then time to head to Wilmington, NC, to see what was new beer-wise in that area. You'll be pleased to learn, as I was, that there is no shortage of good locally brewed beers to found. As usual, I ran out of time before I could get to them all, so a return trip in the near future will most likely be necessary. 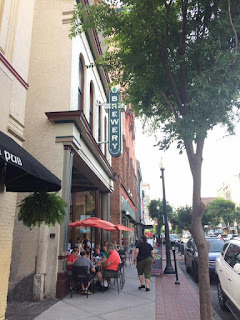 A first stop on any pub/brewery crawl in WVegas is the well known Cape Fear Wine and Beer Pub, which just happens to be a short stroll from Front Street Brewery, so very quickly our crawl was underway. First beer was Wilmington Brewing's Rye IPA. Good one to start with. Next venue was Bombers Beverage Company, a retail store with a dozen guest taps. Tried the Founders' Rubaeus (among others) which is an extremely drinkable raspberry ale. Also contributed to the local economy by purchasing several cans of new brews for us. Next day, off to the beach. Oak Island is well known for its good beaches, which we enjoyed while walking to a lunch spot. It's also known for a new brewery, Check 6. Enough sun, back to downtown Wilmington and my first visit to FlyTrap Brewing! Aaron is a brewer and responsible for the Rye Pale that we enjoyed. Fly Trap is named for the plant, btw, in case you were curious. Small half barrel system at the moment, but upgrading plans are in the works. We liked the feeling in the taproom and we certainly liked the beer, which is only available here for the near future. Highly recommended, add it to your destination next time you're in Wilmington. You just know it's going to be a good day when not one, but two new beers arrive to be sampled, evaluated and drunk (not necessarily in that order)!! Highland Brewing Company has just released two new beers, Lost Cove Kolsch (great timing for this easy-sipping seasonal) and their latest Warrior Series, Mosaic Rye IPL (India Pale Lager!) 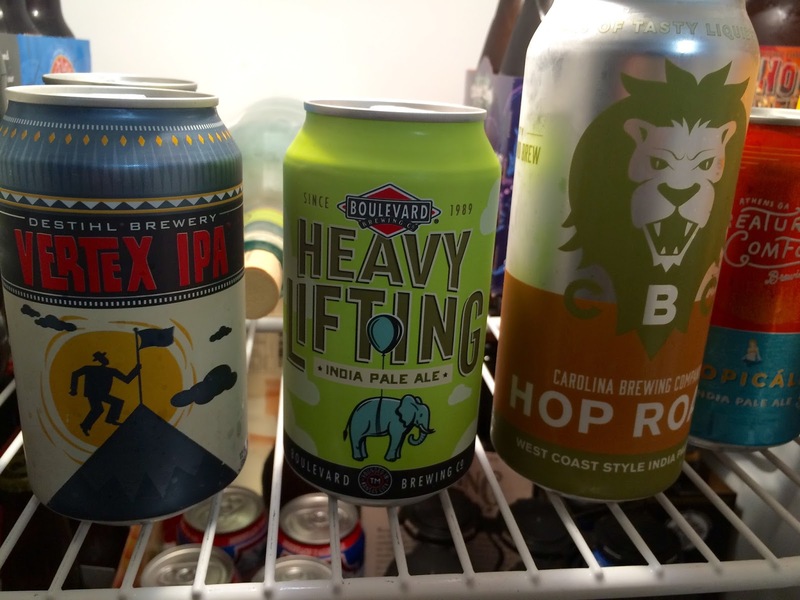 which abound with mosaic hops to complement the Australian Ella hops. Add to that Riverbend Malt House's malted rye and you've got a mouthful of flavor... and in a lager, at that! Currently chilling to appropriate temps, tasting notes and reactions will follow soon. Keep that dial right where it is. 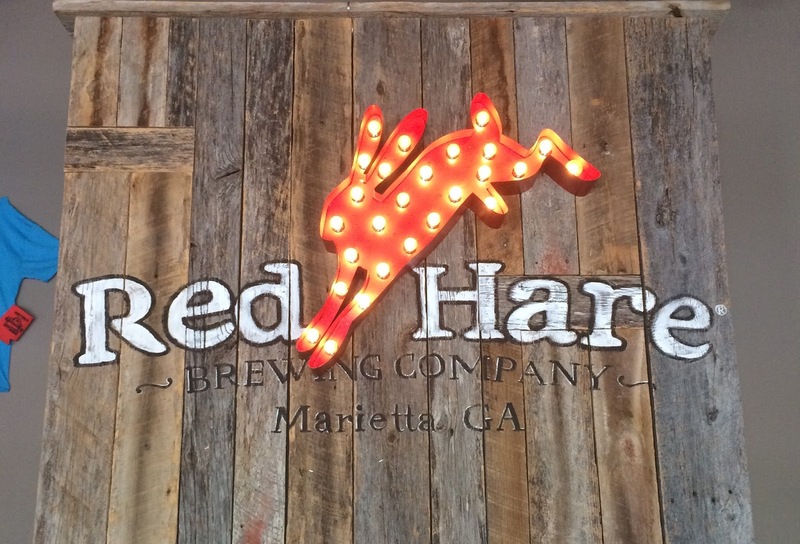 Headed down to GA last weekend, combining family events with visits to new breweries, in this case, all a half hour north of Atlanta: Burnt Hickory, Red Hare and Jekyll. I was familiar with Red Hare and Jekyll's beers, Burnt Hickory was completely new. Makes for a very fun day. Each has an interesting story, perhaps the one from Burnt the one most unusual. This grapefruit soda addition works very well with the citrusy hops used in Gangway and as an experiment, I added some additional Gangway to my glass which kept the sparkling, grapefruit flavor but reduced the sweetness a tad. You can easily make up your own combination, I'm sure Red Hare won't mind. I really liked the brewing facility, in between a warehouse and an industrial vibe, lots of reclaimed wood around and more than one pouring stations, which worked out well the day I was there as a band was playing to a large, enthusiastic crowd. Due to weird GA liquor laws, you pay for a glass and tasting comes with it. The tour is very educational and worth the half hour or so it takes. So, Jekyll, home of Hop Dang Diggity IPA, another one of my favorites, a jewel in the town of Alpharetta, which also has a smaller brewery, Hop Alley, but more about that later. 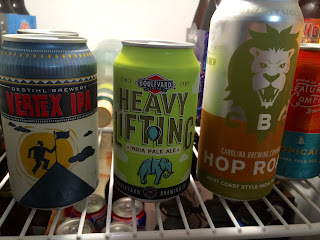 On this, also my first ever visit, I happily discovered another IPA, a newer one called Fixin' To. And since I brough home a crowler of it, I'm fixin' to enjoy it again. It's a session IPA, 4.9% abv, 48 IBUs, with Equinox hops, which is also a new hop varietal for me. Nearby in the thriving community of Kennesaw (? ), found a nano-brewery called Burnt Hickory. Little hard to see from the street so look carefully for signs. The story is that owner Scott Hedeen financed the brewery's startup by selling a portion of his huge record collection, some of which can be seen and heard here. Lots of interesting vinyl for sale, saw a couple that I remembered from back in the day. Looking at the beer menu as a reminder of what was on tap that day. I liked Cannon Fodder, it's grapefruit and lemon flavors really came through, although the abv surprised me, it seemed far less. The others we tried are equally good but most have that high abv thing going, so small samples were the rule of the day. 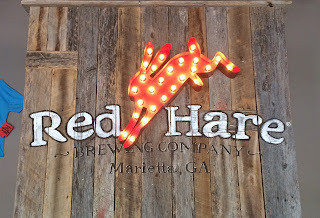 Worthwhile visiting next time you find yourself in Kennesaw, GA.
And if your travels take you near Alpharetta, not so far away, a good place for beer and food pairings is the Hop Alley Brew Pub.